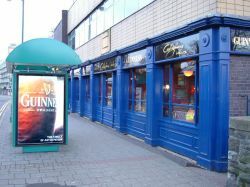 What more could you ask for - a large Irish bar located right alongside the Millennium Stadium walkway. You can be stood at the bar drinking your Guinness one minute, and in your seat in the stadium the next! Being so close to the stadium - Callaghans is an obvious favourite on match days. I was once stood near the doorway during a Wales v Ireland match and a stadium steward walked in offering 2 free tickets to the match. Needless to say, I took the tickets and Callaghans has been alright by me ever since! Wales lost the match incidentally, no surprises there then. - They serve a good pint of Guinness. - The atmosphere is always good humoured...and generally very loud with it! - Live music can be enjoyed here EVERY night of the week. - The walls are dripping with all manner of replica Irish antiques. Being a hotel bar (located under the Holiday Inn) Callaghans is also open later than other pubs. It is generally open until 2am on most nights of the week. There is a good range of bar food served throughout the day including all the usual dishes: burgers, pizzas, baguettes, steaks, and ofcourse, the 'All Day Irish Breakfast'.